This Salad Bowl Finish is non-toxic and designed primarily for wooden items that come in regular contact with food and food products. However, this particular finish is wiped on with a rag and has been designed to produce a harder finish than Preserve. Also ideal for wood turnings, children's furniture and toys. Can be buffed to a high-gloss finish. Safe to put in the dishwasher! 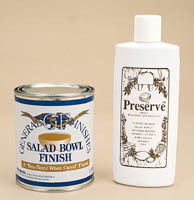 Preserve is a non-toxic finish, containing a rare blend of oils extracted from the meats of exotic nuts. It is designed to penetrate deeply into the fibers of woods to keep the juices and odors of foods from penetrating wooden items used in the kitchen. Perfect for cutting boards, butcher blocks, knife racks, wooden cooking utensils, salad bowls, even children's toys. Hides furniture scratches instantly and enhances the grain of the wood with its golden color. Leaves a soft feel and luster.